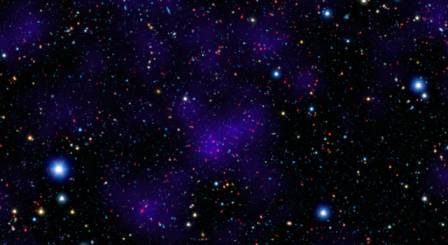 A team of astronomers, using the Spitzer Space Telescope, has uncovered what may be the most distant cluster of galaxies ever detected. The group of galaxies, known as CLG J02182-05102, has about sixty members and is at a distance of 10 billion light years. However, it’s not the size nor the age of the cluster that amazes the team of researchers. Rather, it’s the surprisingly modern appearance of CLG J02182-05102 that has them baffled — a huge collection of galaxies full of old red stars, typical of those closer to home. “It’s like we dug an archaeological site in Rome and found pieces of modern Rome amongst the ruins,” explains Papovich, lead author of the Texas University team’s study to be published in Astrophysical Journal. While its neighboring galaxies appear vastly smaller and far fainter, Papovich says the cluster stands out as a densely-populated bundle of ancient galaxies. Enormous red galaxies at the center contain almost 10 times as many stars as our Milky Way, he notes, combining for a total size that rivals that of the most monstrous galaxies of our nearby universe. Before now, Papovich says, such a finding would be considered by many astronomers to be highly unlikely, considering the time frame in which they were found. This is because current theory predicts that, after the big bang, clusters formed gradually, over long periods of time, from collections of young galaxies full of hot white and yellow stars. The cluster is seen at a time when the universe should only be 4 billion years old — about 30 percent of the universe’s supposed current age of 13.7 billion years. At this point in time, galaxies should still be forming their very first stars and certainly should not have congregated with other galaxies yet. Exactly why these particular galaxies are fully formed that early is what Papovich and his collaborators hope to one day uncover, but for now, studying CLG J02182-05102 could help them and other researchers better understand how galaxies form and cluster in general. To learn more about the team’s research as well as additional information regarding Texas A&M Astronomy, visit http://astronomy.tamu.edu.